Hi everyone. 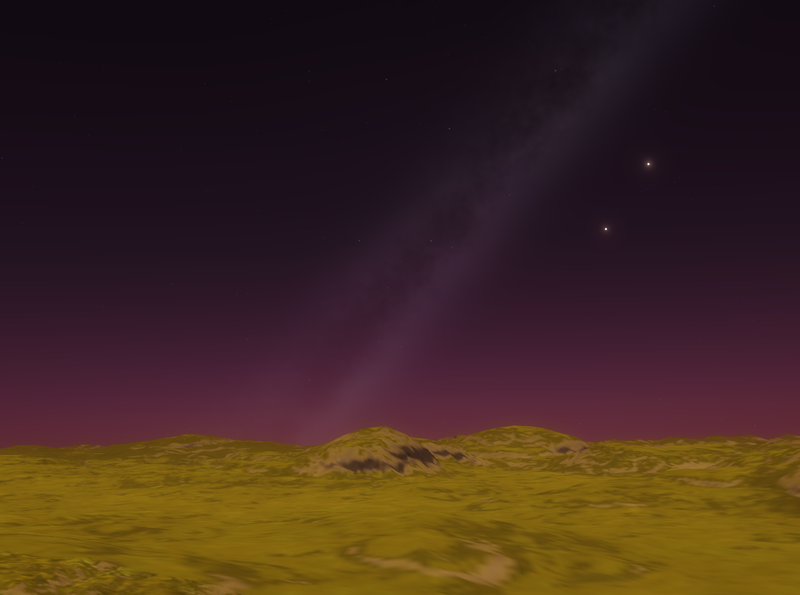 I find myself roaming through Space Engine all around the milky way. I encounter Terra planets if I am patient, Oceanias come more often unfortunately as the amount of water has to be just right. But even when a Terra comes up they often have an atmosphere which is way too thick, and sometimes too thin. Technology may some day make this irrelevant if we can construct highly reliable habitats that maintain temperature and pressure for us, and other life support requirements like oxygen and so on. But alas I kept hunting and hunting for a planet that humans could actually walk around on without any equipment. 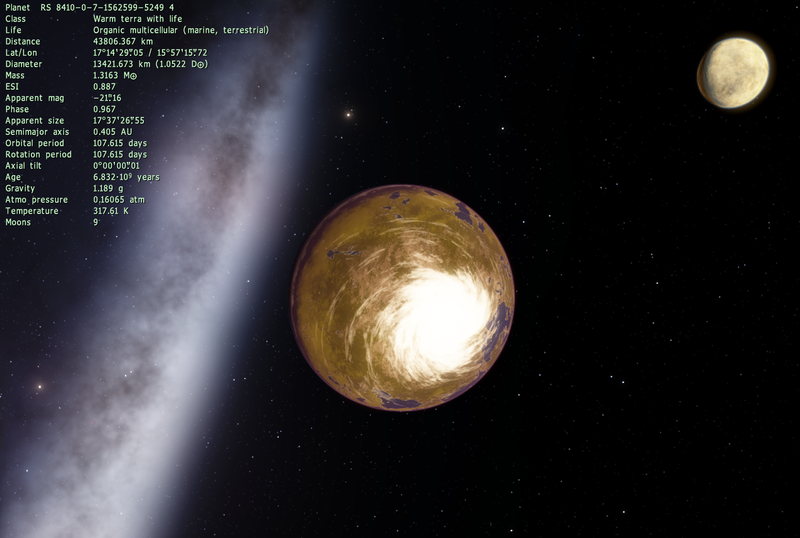 Now, Space Engine does not yet have atmospheric composition (like what % oxygen, other gases) so that's ignored here. But I have finally found one such planet and I wanted to share. Also I have copy-pasted a discussion between myself and a gamer friend on Steam who likes space and he himself has used Space Engine. I hope to generate more discussion here on this forum about this planet, and you could post your own planets you find. depth386: since theres almost no axial tilt, theres no "arctic circle"
From my little understanding though, the low mass and gravity could mean weak magnetic field. Essentially little protection from outside radiation. It's outside of the Milky Way though. Yeah, really. We have had several similar threads recently, which I hesitate to merge since some are lengthy and merging them would only create an incoherent mess. But, any future threads like this are liable to be merged together. I like that this one has the most generalized title, so it should pop up in searches easily. Yeah I tried searching but didn't get anything. I was surprised and I felt uncertain about wether I was searching correctly, I tried widening the search to all of SE forums and not just Astronomy/Science. Anyways eventually I just went for it. Oh darn you're right, SE might not simulate it, this planet would be much more liable to become a "Mars" as the core would cool. 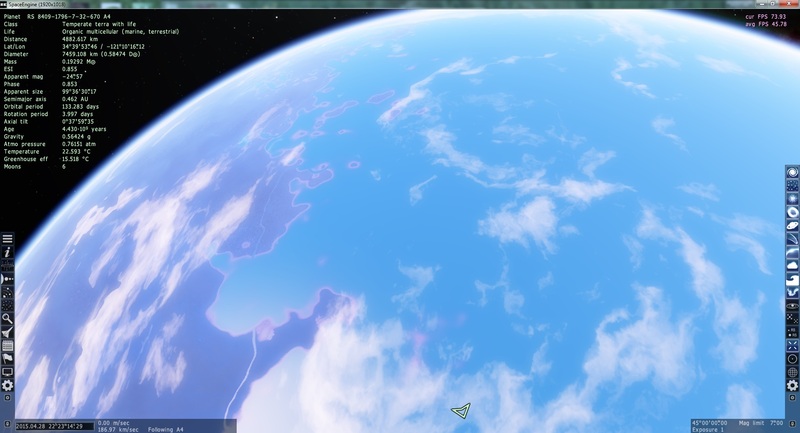 Maybe SE makes it more likely for a planet this size to be a desert, representing one that slipped through the cracks here? Your planet is just AWESOME! Maybe slightly richer in minerals to account for the higher gravity. Bigger core, that sort of thing. But certainly within tolerance, amazing planet! The only major thing I am concerned of are the thin atmospheres of the planets. Unless they have a higher amount if oxygen then earth, you might be able to breathe. Otherwise, magnificent finds! On the Tibetan plateau where you get elevations exceeding 4000 m above sea level you still have people, roads, cars. According to Engineering Toolbox (and many others) that's around 0.65 Atm pressure. Oxygen Content is the caveat here. SE does not give you this data, it doesn't simulate these things. I am saying the pressure alone is not too bad. These planets are acceptable assuming earth's 21% oxygen composition. As you say I think a higher % oxygen content would further compensate for the pressure and a lower % would cause more problems. It has been a topic of speculation for me if you could have humans being okay in something like 2.0 Atm but only 10% oxygen content and assuming no harmful other gases. I believe that the upper limit for atmospheric pressure we want to see is something like 1.2 or 1.3. I am basing this on stuff I've read about curing people who dive underwater for decompression sickness. I might be wrong, you might be able to live in a high pressure environment. Some of these chambers they use to treat people go up to 6 and in some cases 8 atmospheres. I am more certain that given earth-like atmosphere we can handle lower pressures down to about 0.6 and maybe even 0.5 though you'd want to have people from high altitudes on Earth as colonists. 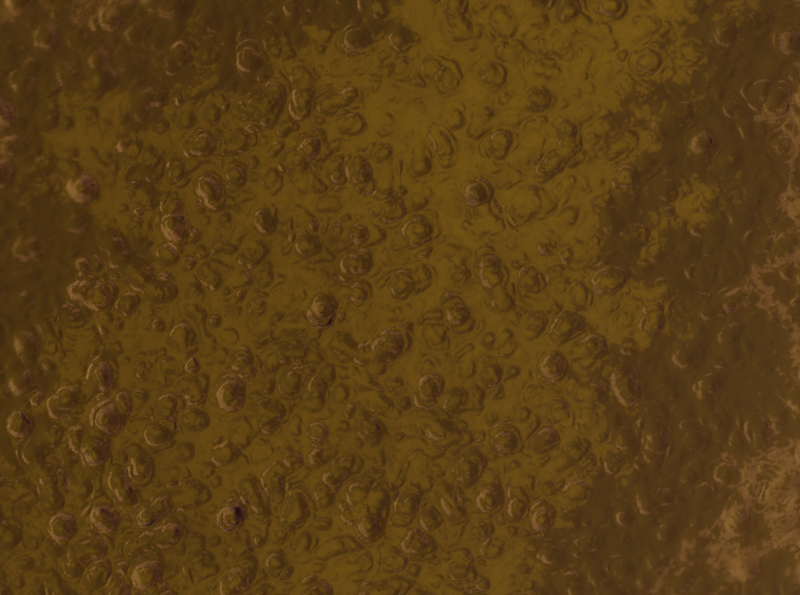 Tidally locked Terra in the LMC. Orbits K1V Star (Nearly 7 billion years old) with extremely thin violet atmosphere. Moon also has some sort of thin atmosphere too. The images taken from the surface looks more like night shots imo but they were taken from the day side, just shows how thin the atmosphere really is... Would be interesting to see the cultures from any intelligent civilizations living on this planet. 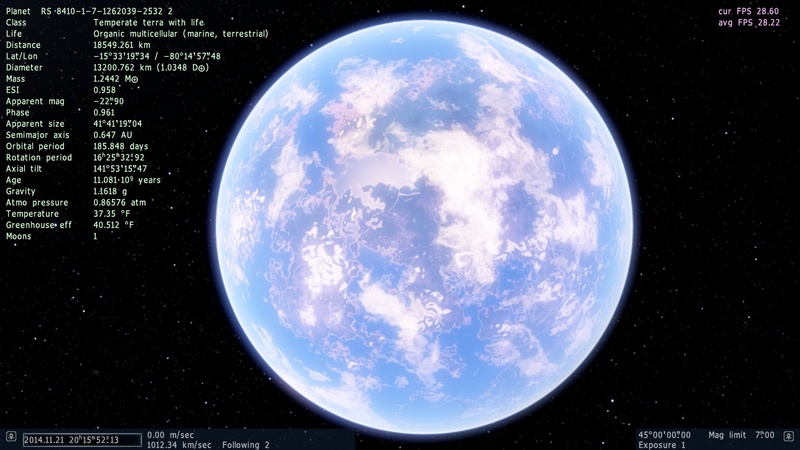 I want to present you another potentially habitable terra (no one expected ). It' located in triple-star system, orbiting K6V star, 4,8 kpc from Sun. It exists in 0.7.4 (8), and I'm not sure if it exists in rc1 (probably not). So here are the photos, is it safety for humans? What do you think about it? Does it have any large moon Kubacki99? pzampella, It has no moons, is it a big problem? Kubacki99, not a problem per se, but given the size of the planet and its age, it should be dead by now... like Mars. That's because a planet with that size should already have a 'cold' core, meaning that it can't have a magnetic field to avoid losing it atmosphere due to the solar wind. 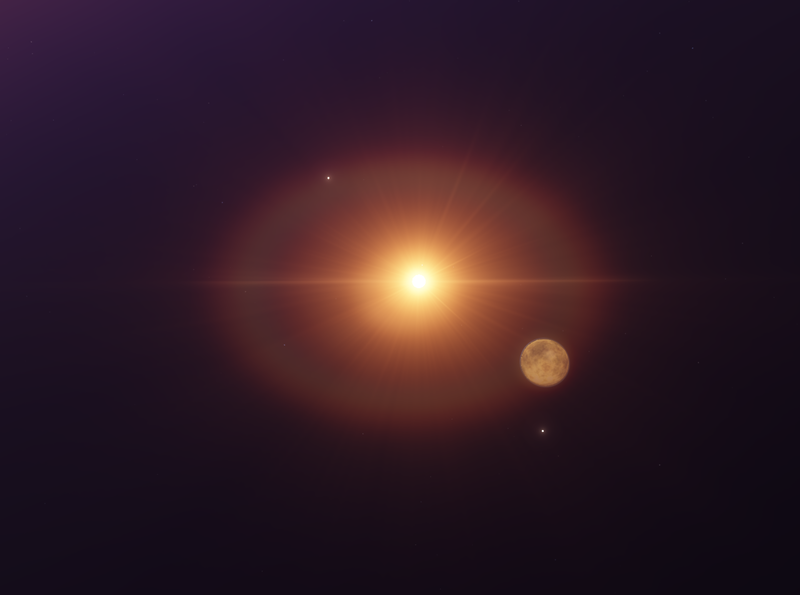 However, a large moon close enough might provide a tidal heat to keep the core hot and in motion to maintain the magnetic field and the planet 'alive'.